A great idea for a Halloween creation or decoration is one thing, but making it on your own is often the fun part. Check out these 20 Halloween projects to inspire your own creation. Put your woodworking skills to the test with this Halloween creation. It starts with building a chair, giving it a distressed look, painting, sanding and staining. This project created a distressed look by beating it with a metal chain. The project used PVC pipe to create the dummy to sit in the chair and added a jig saw to create a shaking effect that will leave people shaking when they see it in action. Find out how to make a chair that’s a little more relaxing. Lay to rest any doubts about who can put together the best Halloween decorations with this graveyard. It’ll take some time to put together the headstones and skulls but with some PVC pipe, stakes and woods, you can have a creepy addition to your yard. Learn how to cut plywood for your own headstones. Have the neighbors believing in UFOs with this Halloween creation. A plastic punch bowl atop a round piece of plywood can form the perfect flying object once you place a foam alien head inside the punch bowl and a gray plastic tarp on the plywood. Add some green lights to the plywood and some light inside the punch bowl to create the effect of a light people won’t soon forget. You’ll need some duct tape for this project, which could come in handy if you need a last-minute costume. Check out duct tape costumes to get some ideas. This creepy creation can fit in the yard easily and requires just a little assembly with some plywood. Have your drill, hammer, saw and staple gun handy to put this coffin together. You won’t need any fancy plywood for this project but you should know plywood grades for the future. This Halloween creation can be done on the cheap if you can find a pallet or two and have the equipment to cut them around. The distressed wood gives it a rustic look and when cut in sections, it’s easy to store. Save some of those old pallets for holiday decorations like a pallet tree. If you’ve got an eyesore spot in your yard then putting in this frightening feature might be easier because it involves digging a hole. 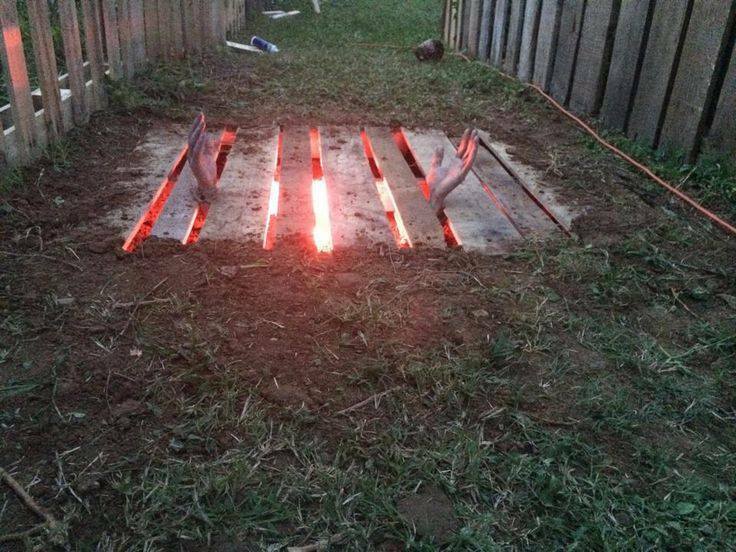 Once the hole is dug, add in a light, a pallet and some fake hands and you’ve got one of the spookiest yards on the block. Once you’re done using pallets to frighten people, use them to create a serene scene by making mini pallets that float. Add a candle to the top for a tranquil evening. PVC is so versatile it can bring zombies to life. Well, in this case at least, maybe not so much anywhere else. This zombie has heated legs and runs on a 5-volt wiper motor to get him swaying. The power pack is cleverly hidden in his shoe. Turns out PVC pipe is pretty handy to have around. Learn more about PVC hacks. Hammer out tin can luminaries in just a few steps to place on your doorstep for Halloween. Mark what you want on the tin can with a marker and freeze water in it before hammering the design out. After you’ve got the design done paint. Once the paint dries place a candle inside and enjoy. Find all the steps to make this creation here. Tin can luminaries can reduce the chance of any pratfalls that you make experience with a paper bag luminary. Keep your cauldron cooking with these faux burning embers. Grab some spray foam insulation, orange string lights, plastic bottles, rubberized undercoating, plastic floor liner and some spray paint to get going. Check out the complete plans at Instructables.com. Turn any leftover spray foam into something else magical after you discover other brilliant uses for spray foam. Make the most of your miter saw for projects like this and learn some miter saw tips. You won’t need much concrete but mixing concrete properly is key. If you feel like you’re being watched, that might just be the case if someone has put these giant eyeballs somewhere. It’s on the lighter side of Halloween creations and perfect for a neighborhood of kids less inclined to handle scarier stuff. This project takes about 30 minutes to paint and two-to-four hours to have the paint dry. For the full plans go to Instructables.com. Make sure you find the right paintbrush for painting the giant eyeballs. This clever creation fits perfectly in a window near the door to spook trick-or-treaters on their way to the stoop. It takes just a few supplies to put it together. The tricky part might be finding an old photo that’s just haunting enough. Get the step-by-step directions at Instructables.com. If you have trouble finding the type of frame you want, create your own picture frame. You’ll need to spray paint the helmet to get the ball rolling, so find out how to spray paint perfectly. This design will dress up your front door easily. Made with a little plywood, lights, hardware and paint, it uses batteries to stay portable. Check out the complete plans at Instructables.com. Once you’ve got this one done, check out what you can build with a jigsaw. There are a number of novelty Star Wars-related objects available on the market but there aren’t as many as refreshing to see as this R2D2 beer cooler. Find out how to build it at Instructables.com. Hopefully you didn’t need to take the top off your barbecue grill to complete R2D2. This project can be a good reminder to update your grill. Since Back to the Future II came out in 1989 we’ve seen some things predicted for the future come true. The Cubs finally won the World Series and we’ve kind of have hoverboards. Today’s hoverboards still aren’t as cool as what we saw in Back to the Future II so why not create your own that looks like the model? Fortunately there are plans available to do that in time for Halloween on Instructables.com. If you’ve got leftover foam insulation from finishing a basement or something, then this is a no brainer. Transformers might be robots in disguise but the chairformer might as well be dad in disguise. This genius design is sure to put a scare into someone unsuspectingly trying to sit down. This project used a band saw to make the chair and if this is a little too ambitious for you, try using a band saw to build a box. If you want to see a jump out of someone, this giant mouse trap is sure to do the trick. Don’t worry, it isn’t actually spring-loaded but those who get close enough might think otherwise. The wood from this project came from a bathroom remodel. You never know what you can make out of a pile of old wood. Zombies still roam the streets on Halloween but you can ward them off with a bottle cap armored bracer. Armor might be tough to find while scavenging through a wasteland so don’t let bottle caps go to waste. If you have trouble getting finding a bottle opener to get bottle caps off, learn ways to open a beer bottle.